19 tracks: Fisherman’s Reel * Joe McDiarmid’s Jig * Viennese Swing * Mississippi Dip * Lion Standard Quadrilles * Edinburgh Mixture * Dundee Reel * Shifting Bobbins * 6/8 March * Nottingham Lace * Student Lancers * New Killarney Waltz * Bees of Maggieknockater * Palais Glide * Boston Two-Step * Irish Rover * Jacky Tar Two Step * Seton’s Ceilidh Band * La Russe. 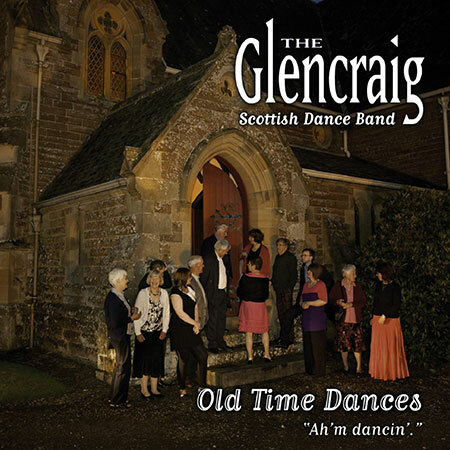 This is the final album in a series of four by the much-loved Glencraig Scottish Dance Band. The series covers all the Scottish dance formats that the Glencraig Band perform - The Ceilidh, The Reel Party, Scottish Country Dances and Old Time Dances. The previous three albums were Are Ye Dancin’? (The Ceilidh), Are Ye Askin’? (The Reel Party) and Ah’m Askin’ (Scottish Country Dances). All of these albums contain full dance instructions within the CD booklets. The Band has been performing for over twenty years and is one of the few bands that specialise in playing for all types of Scottish Social Dancing. Their leader Nicol McLaren has always been passionate about set construction and arrangements to match the dance, and maximise the interest and enjoyment of dancer, listener and musician alike. They are one of the busiest bands around, and perform in venues from the smallest village hall ceilidh, to Caledonian Balls in the Middle East and Russia, to RSCDS Balls from Aviemore to Australia. The band members are Nicol McLaren (lead accordion), Gordon Howe (fiddle), Neil Caul (second accordion), Isobelle Hodgson (piano), John Sinton (double bass) and Robert Simpson (drums). Dance instructions are by June Templeman, Jessie Stuart and Karin Ingram. Photos are by Annie Tuite and recording is by Stuart Hamilton of Castlesound Studios. Design is by John Slavin at Designfolk. This is a unique project and we believe it is the first time it has been tackled in such depth. Greentrax are proud to be involved.